1. Richard II at Chesapeake Shakespeare Company. “The Chesapeake Shakespeare Company’s production of Richard II should not be missed because of its historical significance and for its extraordinary production value.” – April Forrer. Synopsis: One of Shakespeare’s most eloquent works is this poetic chronicle of the cultured and vain King Richard II, who believes himself divinely placed on the English throne. His arrogance contributes to his undoing and the onset of the Wars of the Roses. Rich with beautiful language, this “Hollow Crown” history remains one of Shakespeare’s most-loved plays. Jonas David Grey as Richard II and Patrick Kilpatrick as Henry Bollingbroke. Photo by Teresa Castracane Photography, LLC. 2. Rage at Ambassador Theater. “Rage is wonderfully executed, terrifyingly brilliant, and seriously scary.” – Heather Hill. Synopsis: In this tense, one-act, Canadian play, an unstable high-school student confronts a pacifistic guidence councelor in her claustrophobic office at the school. During their increasingly heated conversation a gun is produced, and their encounter becomes a battle of wills. Will “justifiable” violence or passive resistance win the day? Who will survive? 3. Hedda Gabler at Quotidian Theatre Company. “…Ibsen’s ‘Hedda’ has never been so lively…” – Andrew White. Synopsis: The magnetic and mysterious Hedda Gabler, stifled by society’s conventions, has captivated audiences since she sprang from Ibsen’s imagination in 1890. Her perplexing machinations find the perfect home in Washington, D.C.’s politically-charged Georgetown of 1963 in this new adaptation by Iceman Cometh director Michael Avolio. 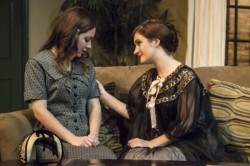 Sarah Ferris as Thea, Katie Culligan as Hedda. Photo by St. Johnn Blondell. 4. Macbeth at Annapolis Shakespeare Company. 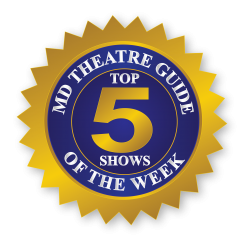 “Annapolis Shakespeare Company’s production of Macbeth is absolutely worth seeing…” – April Forrer. Synopsis: Macbeth, set primarily in Scotland, mixes witchcraft, prophecy, and murder. Three “Weïrd Sisters” appear to Macbeth and his comrade Banquo after a battle and prophesy that Macbeth will be king and that the descendants of Banquo will also reign. When Macbeth arrives at his castle, he and Lady Macbeth plot to assassinate King Duncan, soon to be their guest, so that Macbeth can become king. Brit Herring as Macbeth and Rebecca Swislow as Lady Macbeth. 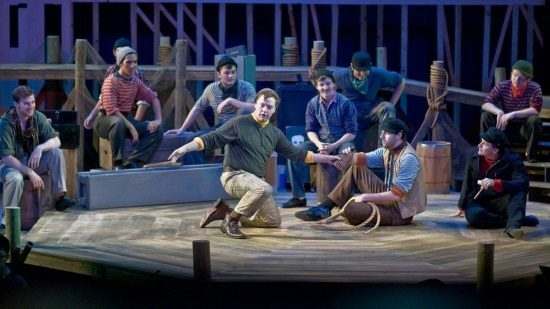 Photo provided by Annapolis Shakespeare Company. 5. 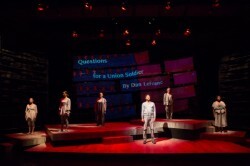 Our War at Arena Stage. “…Our War’s spare production style emphasizes story over spectacle.” – Elizabeth Bruce. Synopsis: An esteemed collection of some of America’s finest playwrights, including winners of the Pulitzer Prize, Tony Award and Olivier Award, has been assembled to create a dynamic new theatrical event reflecting on the repercussions of the U.S. Civil War. 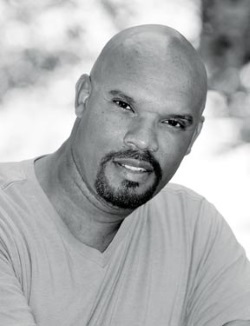 Through a rich tapestry of short monologues, a core ensemble of gifted actors, accompanied by notable Washingtonians, give voice to far-reaching questions about the war, its aftermath and its reverberations in our lives today. Our War, commissioned by Arena Stage for the National Civil War Project, uses the power of live theater to bring new understanding to the shades of Blue and Gray that define one of the most significant periods of American history. The cast of Our War. Photo by Teresa Wood.